If you are holidaying in Croatia visiting Trogir and/or Sibenik is a very doable option from Split. 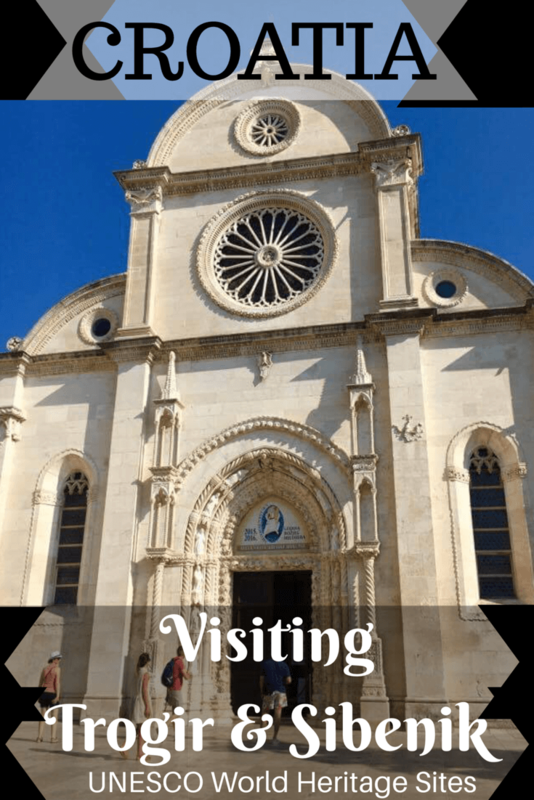 They are both UNESCO World Heritage Sites (in Šibenik its the cathedral that is listed) and are well worth visiting if you have the time in your Croatian itinerary. In fact Trogir was named the best city-island in the world by National Geographic in 2015. Both towns are far less crowded than the major Croatian tourist destinations of Dubrovnik, Split, Plitvice lakes, Krka National Park etc. 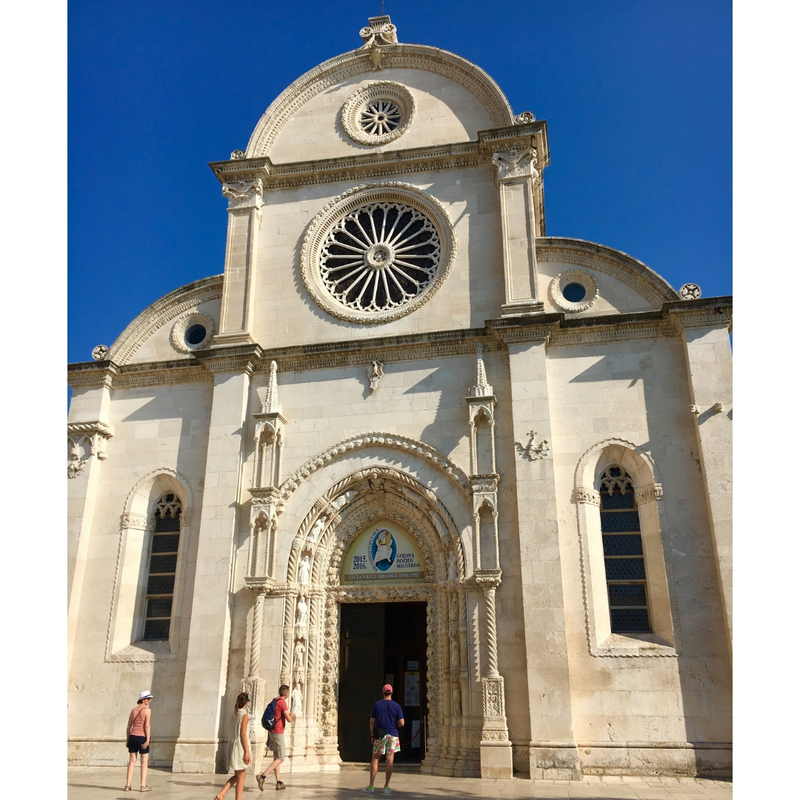 If you are wondering how to travel to the towns there is more information at the end of the post about how to travel from Split to Trogir and Split to Sibenik. 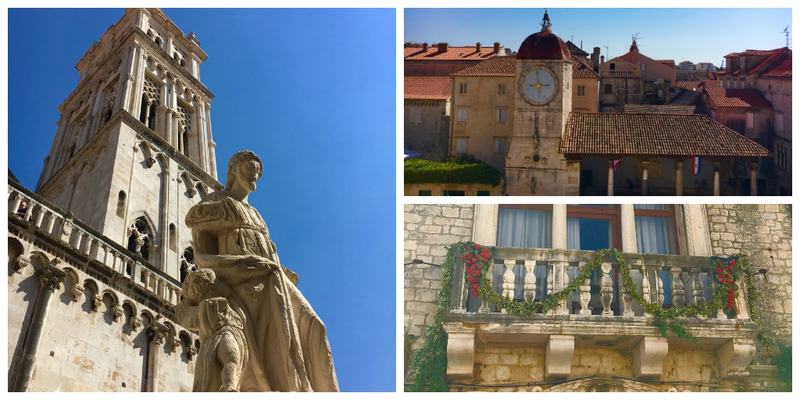 Trogir is only 30 kms from Split and although it is possible to catch a bus* from Split to Trogir we visited as an add on to a tour of the old town of Split. The tour included transport to Trogir where we were briefly shown around before being left to explore for an hour or so before returning to Split. We spent about 2 hours in Trogir but it was enough to get a sense of the place. and see the main sights. 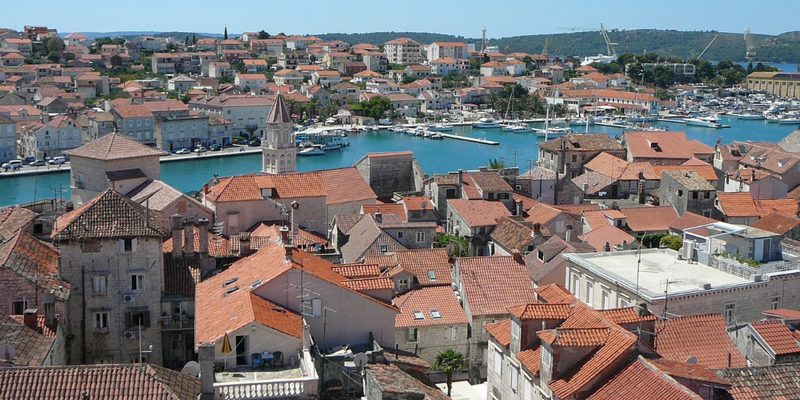 Trogir is a historic town which has been added to and developed throughout many centuries. There are examples of buildings built in the Classic, Romanesque, Renaissance, and Baroque styles. These reflect the various rulers of Trogir during the Hellenistic, Roman and Venetian periods. Trogir was inscribed on the UNESCO World Heritage List in 1997 and is (to quote UNESCO ) “a remarkable example of urban continuity.” It is one of the best preserved medieval cities in Europe. 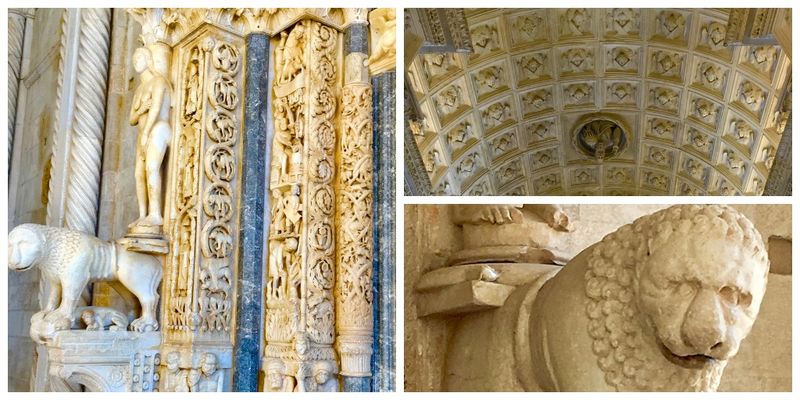 WHAT IS THERE TO SEE IN TROGIR? The first thing you will notice is that Trogir is built on a small islet located between the Croatian mainland and the island of Ciovo. The islet is only 500m long and 250 m wide. 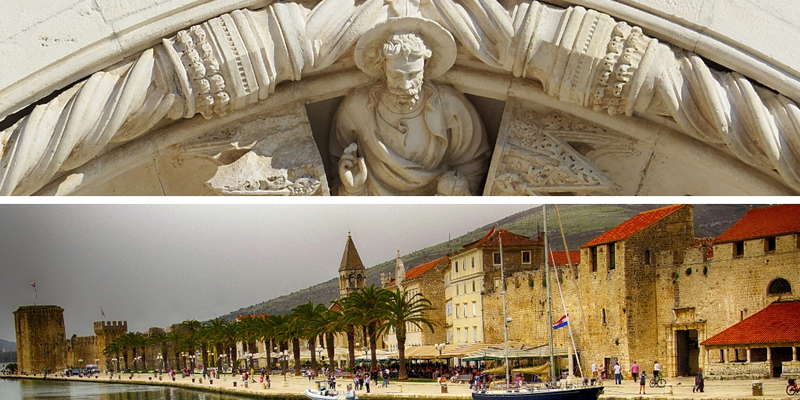 To access Trogir walk across the bridge which will lead you into the town through the north gate (built around 1656) Look up and you will see a statue of the patron saint of Trogir – bishop John. It takes about 30 minutes to walk around Trogir. Stop and admire the beautiful buildings and architecture as you stroll around. 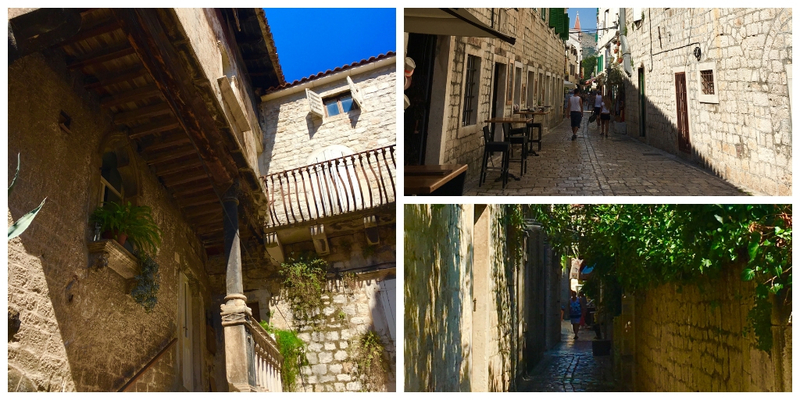 Although Trogir is only small it is easy to get lost in the narrow alleyways – we did! The architecture of all the buildings in Trogir is stunning with so many beautiful balconies, squares, palaces and alleyways. The main buildings to look for when you are strolling the town are – the 13th century Cathedral of St Lawrence with its very impressive Portal of Radovan, the City loggia, the Karmerlengo fortress and St Marko fort, the Cipiko Palace, and the Waterfront Promenade. The Cathedral of St Lawrence took over 4 hundred years to build. Enter through the Radovan Portal which was completed in 1240. It depicts scenes from the bible and is flanked on either side by 2 lions representing power and strength. 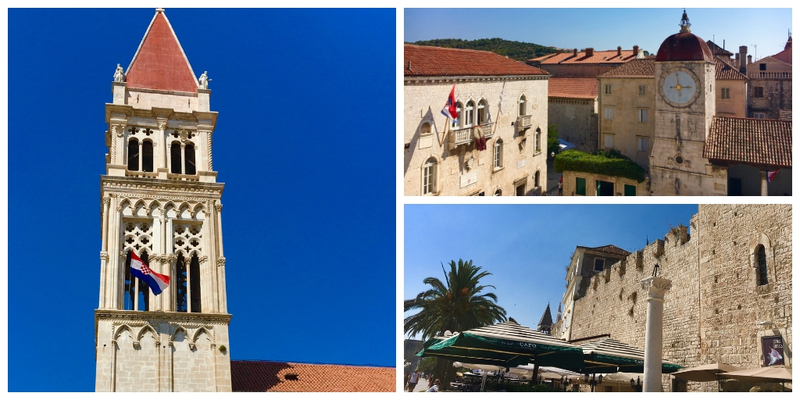 TIP – When you visit the Cathedral of St Lawrence climb up to the belfry and enjoy beautiful views of the rooftops of Trogir. When you exit the St Lawrence Cathedral walk over to the stunning Cipiko Palace with it beautiful balconies and gothic ornaments. Another main feature of the main square in Trogir is the city loggia or porch. 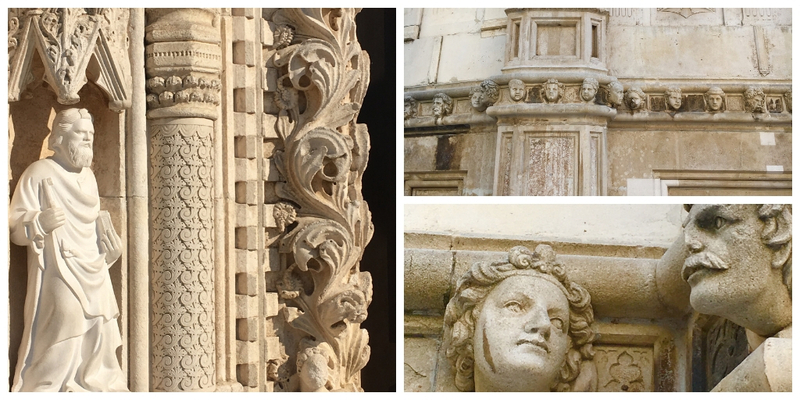 Check out the emblems of the different noble families of Trogir on the walls of the loggia. Part of the original walls remain on the coastal side of the town as well as 2 towers which were built by the Venetians in the 13th century – the Fortress Karmerlengo and St Marko fort – to protect the harbour. To access the waterfront promenade exit the town through the doorway in the middle of the two towers. Enjoy some refreshments when you reach the port and promenade. We stopped for an ice cream and sat admiring the boats moored in the harbour. We visited Šibenik at the end of day trip to KrKa National Park. It was literally a quick stop at the end of the tour to look at the Cathedral of St James as this is the UNESCO World Heritage Site. Although we couldn’t actually see inside the the Cathedral as someone was getting married that day we did have a good look at it from the outside. The Cathedral is special because over the 105 years it took to be built 3 different architects were involved and the result is a building which is a blend of Gothic and Renaissance forms. The Cathedral is built entirely of stone. No mortar at all. It is basically like a giant lego construction held together by well cut blocks! It also has a very impressive portal apparently built to compete with the Portal of Radovan in Trogir. Check out the rather interesting frieze around the Cathedral. It consists of 71 faces of men, women and children who lives in Sibenik. We added our visits to Trogir and Sibenik onto the end of other excursions but this isn’t a budget friendly option. If you are on a budget and are considering one tour I would suggest visiting Trogir. Alternatively if you prefer to visit independently it is easy travel from Split to either town quite easily by bus – Sibenik is 88 kms from Split while Trogir is a mere 30 kms away. To travel from Split to Trogir by bus click this link. This trip takes 30 minutes. As mentioned previously they are both UNESCO World Heritage Sites. 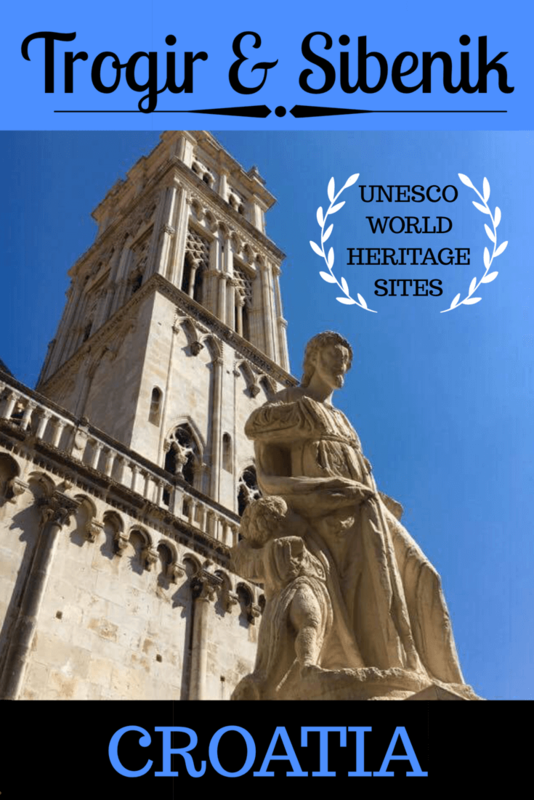 You can read about them on the official UNESCO site – the Cathedral of Sibenik and Trogir. Still have to travel to the region and it looks really worth a trip. But again – the crowds an the temperatures really put me off since we can only go in high season. Would you suggest to go in July or August or better wait till we can travel off season? I think I would recommend to go when it is low season Jurga. The worst place for crowds was Dubrovnik. Trogir and Sibenik were not too bad at all. I think its the cruise ships which make Dubrovnik a not such attractive destination in high season. The day we were trapped in the city was really unpleasant and quite scary.We are also stuck with travel in high season for the moment – makes deciding where to go a bit tricky sometimes! wow – thats a pretty impressive cathedral! I love the gothic era, it’s just so pretty, but a little bit scary looking too! Thanks Alex – yes those heads gave me the creeps a little! Yes definitely – I need no excuse to revisit Split i just fell in love with it! 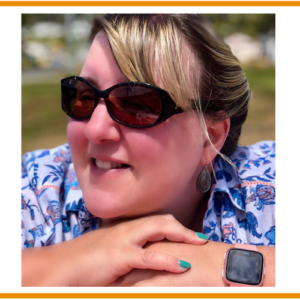 Thank-you Katy I love taking part and reading so many great posts. Glad you are enjoying all my Croatia travels! I’ve really enjoyed all your Croatia posts. I’d love to go next year and go to Trogir. Thanks for sharing. What beautiful buildings! Until we can get away to explore Croatia, we’re loving your posts! thanks you guys 🙂 Glad you are enjoying what seems to be a never ending series of posts on Croatia!It is such a fantastic country I am sure you will love it! What a great mission to see all the UNESCO sites! These two sound fascinating. The construction of the Cathedral is almost unbelievable. What a shame you couldn’t see inside -blinking weddings! Thanks so much for linking with the last #MondayEscapes of 2016. See you again next year! Thanks Claire – it has been great linking-up! It will be quite some feat to visit all the UNESCO sites but I am 50 odd down (only another 1000 or so to go eek!) See you in 2017! It is lovely and I am sure you will love it – there is so much to see and do there! I lived next door to Croatia for 33 years but never could go visit it. The Communists were in power at the time and they didn’t allow the Romanians to go anywhere outside the border (except if you worked for them and were willing to become informers). Croatia is at the very tom of my list and your article convinced me even more that I have to go there. Thanks for sharing it. It is a fabulous country to visit. I can’t imagine what it must have been like not being able to leave your country. I have written quite a few articles about Croatia (and one or two more to come) so hope you will manage to read one or two of them too. Thank you for commenting. It is an amazing country – we loved it and highly recommend visiting!